Thank you for your interest. 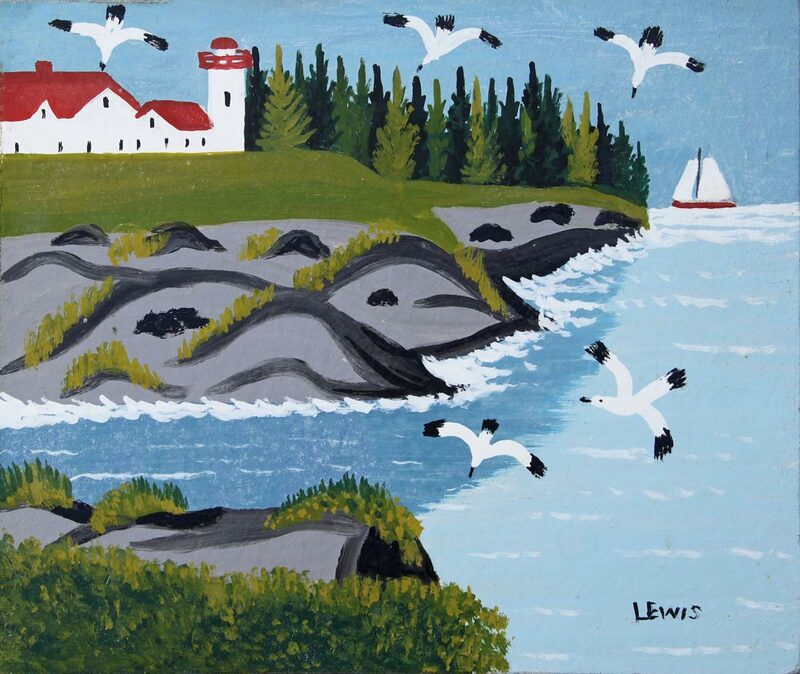 We have now sold two original paintings by prolific Canadian artist Maud Lewis. 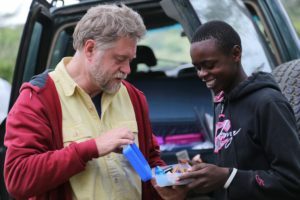 Interested in supporting The Kenya Initiative? We have plenty of other artwork donated by local artists available for sale. 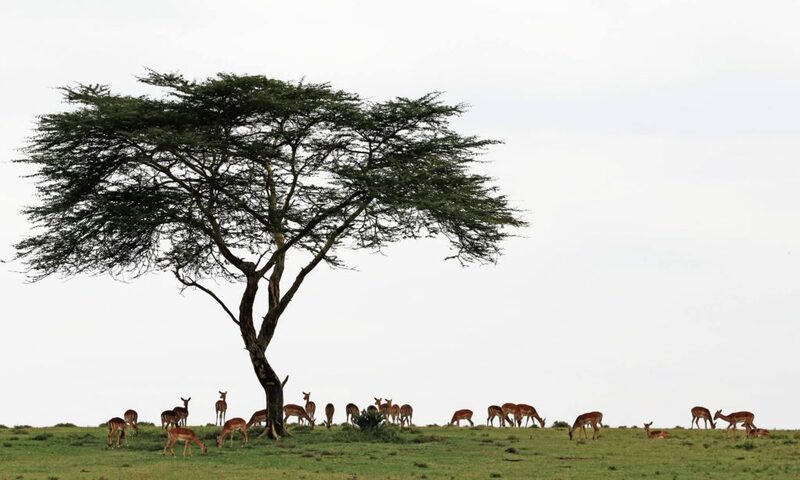 100% of the funds raise go direction to benefit our projects on the ground in Kenya. Please contact Raymond Vos at galleryraymond@cogeco.net for inquiries. 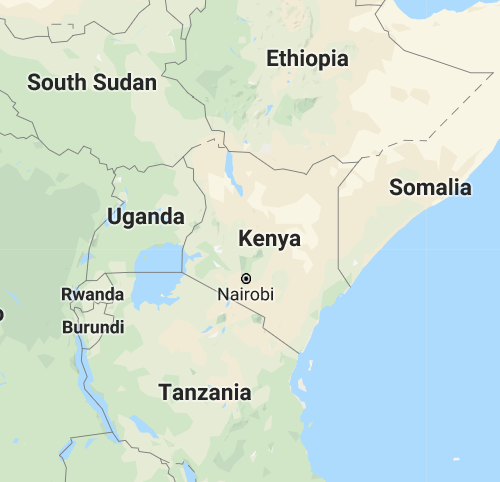 25% of funds raised went directly to benefit the Kenya Initiative, a charitable organization dedicated to getting young Kenyans a high quality education. I was approached by one of the owners of these two paintings, a long time client, in late May. The two paintings had been given to his parents as a cottage gift by his aunt after she had returned to Ontario after visiting a good friend in Digby, Nova Scotia sometime in the 1960s. He and his sister, after learning of the recent auction of the Maude Lewis painting for the Mennonite charity, had decided that the paintings were simply too valuable now to remain at their family cottage and they asked me for my help in selling them. They both have enthusiastically supported my idea of the charity auction and turned down a recent offer to sell the painting to another dealer at close to double the appraised value. Both paintings are now sold. 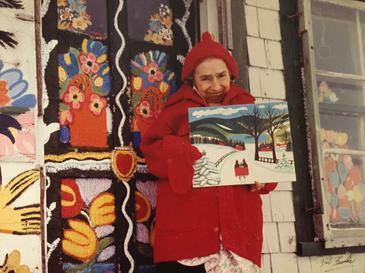 Born in South Ohio, Yarmouth County, Nova Scotia, Maud Lewis is renowned for her bright paintings of Maritime rural life. Having contracted polio, and suffering from juvenile rheumatoid arthritis, Lewis left school at the age of 14 and lived a confined but happy life at home. She began her artistic career by painting Christmas cards with her mother that they sold on the streets of Yarmouth. Following the death of her parents, Lewis moved to Marshalltown, Digby County, Nova Scotia to live with her aunt. It was there that she met her future husband, Everett Lewis, a fish peddler. They married in 1938 and moved into his small cabin. Due to her small stature and her arthritis, Maud was unable to do housework. However, she helped with the household by creating cards and paintings for income. Everett often took Maude with him while selling fish and would promote her artwork to his customers. With his encouragement, Lewis began to produce more paintings. Her work grew in popularity, and buyers began to come directly to her home to acquire her paintings. 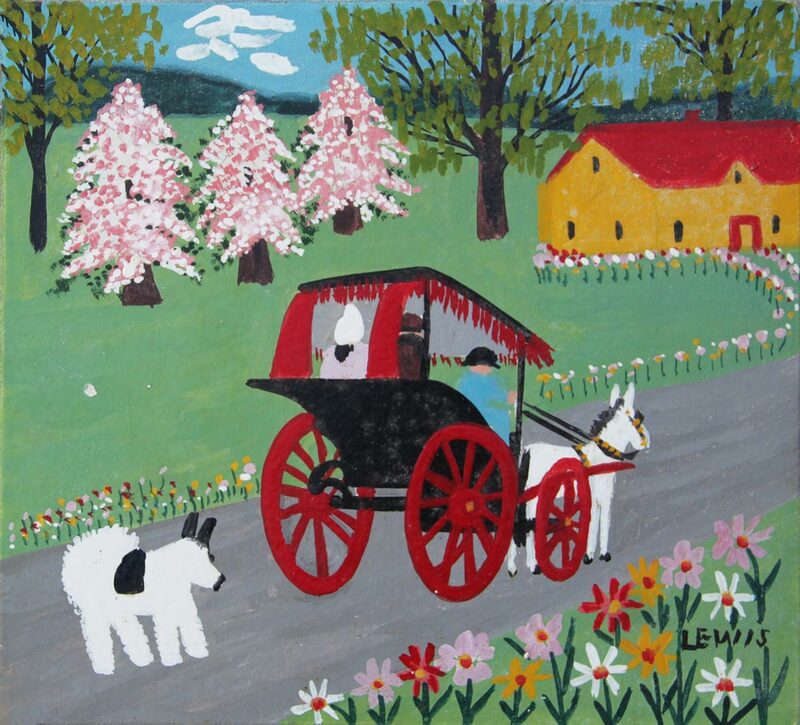 Despite her lack of formal training, Lewis’s depictions of rural life, animals and landscapes, drawn from her everyday experiences, had an irresistible charm and vitality. She often used oil paints straight from the tube and rarely mixed her pigments, and her colourful work expressed the essence of Maritime life. Her work gained popularity to the point that she was featured in numerous newspapers, such as the Moncton Times, the Atlantic Advocate and the Star Weekly, and she also starred in a CBC-TV Telescope program in 1965. In 1967, her work was shown at the Centennial Exhibition of Primitive Art in New Brunswick at Beaverbrook House, St. John. Prominent collectors of her work include R.L. Stanfield, the former premier of Nova Scotia and Richard Nixon, the former President of the United States. Her paintings still hang in the White House and the Legislative Building of Nova Scotia. Lewis passed away at the Digby General Hospital at the age of 67 in 1970. She has become one of Canada’s most well-known and endearing folk artists. The Art Gallery of Nova Scotia has a large collection of her paintings, and installed her original house in the gallery as part of a permanent exhibition of her work. In 2016, a film was released on her life entitled Maudie. John Njane, his brother Chris and I traveled north of Thika in the area of his family’s compound to continue to interview and do a photo-shoot with some of the Widows. The plan is that the material be used for publication—either a magazine article or a book. Or both. Profits would be returned to the Widows for educational needs for their Grandkids. It has been an honour to listen to them and hear the stories of their lives. We sourced Solar Lights in Nairobi as a gift to them for letting us intrude on their lives. We had no idea how life-changing it would be. A HUGE THANKS to the 30 people who responded to my original plea and paid for the lights for the Widows and their Grandchildren! 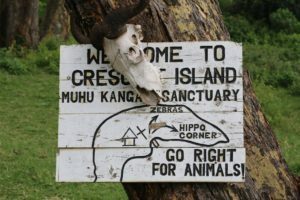 We took the boys and girls for a day trip to Crescent Island Animal Sanctuary. It was a lot of fun getting to know one another and chasing the Giraffes, Zebras and other native wildlife. Such a joyous time! 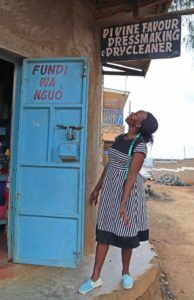 The Kenya Initiative and Flow of Hope are sponsoring them through High School and Medical Clinical School. We are still running short on some of the school fees. Please contact me if there is any way you can help. Anything is appreciated! When Irwin and I were in Kenya three years ago, we felt drawn to help Ann, a woman in the “Thread Of Hope” Sewing training centre. We each contributed $90 each for a Micro-loan for her. Less than a year later we heard that she had graduated from the course and had started her own seamstress business. A year after that she was looking for help for all the work she was getting. It was so wonderful to meet her three years later! Such great news from a seed planted in good ground. Thanks to John Njane and Beth Weitensteiner for your help with this!